More reward for fraud at the top. Mandelson, of course, is a high priest of the laissez faire, free market capitalism which has so spectacularly failed. Yet no news media put this point to either him or the public. As if this was a bombshell for him. The very first sentence he utters before he even takes up a new job is a lie. Mandelson, of course, is a high priest of the laissez faire, free market capitalism which has so spectacularly failed. That's what they would like you to believe as they nationalize the economy faster than you can say 'Hugo Chavez'. What has 'failed' ( if this 'failure' wasn't planned) is a perverse form of crony capitalism based on unsound money and the collusion of bankers with government. Once Twice Three times a Mandy. Will he resign a third time? How Low can this Labour government sink? And Margaret Becket, will she be touring in her caravan? The very faction Mandelson represents. One of the greatest casualties of the rise of the Political Class has been the once all-powerful figure of the Cabinet Secretary, traditionally Britain's most senior civil servant and a voice of independence and integrity at the very heart of government. The sharp decline in the influence and weight of successive Cabinet Secretaries, leaving them increasingly peripheral and compromised, is one of the most significant political developments of the past 25 years. They have seen their role reduced to assistants, and even at times apologists for the Political Class. Again and again they have been pressured into carrying out furtive political favours for the Prime Minister of the day, causing an enormous longterm loss of authority. One early manifestation of this contempt came when Peter Mandelson resigned as Trade Secretary at the end of 1998 following the revelation of the Robinson loan. In an attempt to give the impression that due process had been observed, Downing Street claimed that the then Cabinet Secretary, Sir Richard Wilson, had "investigated" the affair. In fact, Sir Richard had carried out no investigation. He merely sent a one-line message to the Downing Street chief of staff Jonathan Powell, which included the opinion that, from Sir Richard's point of view, there had been "no impropriety". Something astonishingly similar occurred when Mandelson resigned for a second time, barely 12 months later, this time as a result of confusion about whether he had exerted improper pressure to secure passports on behalf of the Hinduja brothers. Once Mandelson had reluctantly resigned, a series of reports appeared in the Press to the effect that Sir Richard Wilson had been responsible for his decision to quit. These can only have come from Tony Blair's Downing Street advisers, who were probably eager to place the blame for the resignation fiasco elsewhere. While Gordon was going through his 'we shall fight them in the hedge funds' routine, stage left his new best friend was slithering into the House of Lords. On any normal Monday, the elevation to the peerage of the obnoxious Peter Mandelson would be dominating every newscast. Mandelson is a perfect example of a political confidence trickster at work. Have met the guy many times when he was our local MP, he only lived round a couple of streets away, used to 'bump' into him at the local corner shop quite often. Going by talking to him first hand you would swear he was one of the nicest people you'd ever met, my old mother still thinks he's the greatest politician ever. Yuck pass the sick bag, Mandelson makes me want to vomit. He looks like SATAN getting ready to deliver xmas presents. And here he is today exposed as in bed with Berezovsky gangster-oligarchs of the world. Everybody in the press dislikes him and nobody trusts him. Mandelson makes me want to vomit. He looks like SATAN getting ready to deliver xmas presents. Peter Mandelson joined Russian oligarch Oleg Deripaska for at least two dinners in Moscow while he was European Trade Commissioner, his former aide has revealed. The controversial new Business Secretary is facing calls to make a statement to the House of Lords to explain more about his friendship with Mr Deripaska. Concerns over a 'potential conflict of interest' have arisen after two companies asked for Lord Mandelson's help following claims that one of Mr Deripaska's firms had cheated them over a $1billion (£575million) deal in Moscow. The then-commissioner took up their case only for it to emerge that he had enjoyed hospitality aboard the 238ft yacht Queen K, owned by the very man who was the subject of the complaint. Now the details of two meetings with Mr Deripaska have been revealed in an online blog written by Benjamin Wegg-Prosser, a former aide to Lord Mandelson who was at both dinners. Mr Wegg-Prosser, who now lives in Russia was trying to defend Lord Mandelson when he wrote today: 'On one of his more recent trade trips to Moscow Peter spent a day at our dacha. 'We tried to go for a walk but it was -20C and we only got as far as the end of the path before turning back. We then went into Moscow and ended up having dinner with Deripaska. 'My main memory from the evening was the fierce disagreement, to the point of raised voices, that both men had on two issues. First, Russia's entry to the WTO. Peter wanted them to join, Deripaska didn't. 'Second, the tariffs which the Russians were imposing on Finnish timber imports. Peter said they were illegal, protectionist and wrong, Deripaska argued that they were a necessary defence mechanism to protect a key national industry in an emerging economy. Meanwhile, the Tories have been accused of running a 'smear' campaign against Lord Mandelson after an MP used parliamentary privilege to highlight his links to Mr Deripaska. Commons leader Harriet Harman hit out today after Tory backbencher Hugo Swire raised claims about Lord Mandelson's relationship with Mr Deripaska this summer. Lord Mandelson, who controversially returned to the Government this month after twice resigning from the Cabinet when he was an MP, introduced an order that would allow the merger of HBOS and Lloyds TSB.. The times reported this slightly differently and included some interesting info regarding Deripaska and Mr Mandelson's relationship to the Rothschild family. One of Deripaska’s key financial advisers is Nat Rothschild, who is co-chairman of a New York hedge fund and a friend of Mandelson’s. Nat Rothschild’s father, the financier Lord Rothschild, owns a villa in Corfu where Mandelson has stayed as a guest. 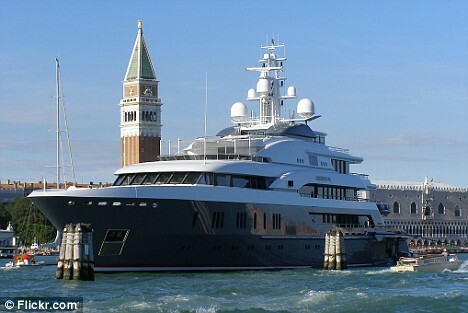 The Queen K is understood to have been moored just offshore from the villa. Sir, Since your paper - along with your sister publication The Sunday Times - has made much out of what may or may not have happened at a private gathering of my friends this summer in Corfu, I thought I should make the following observations. I am surprised that you focus on the fact that one of my guests, Peter Mandelson, is a friend of another, Oleg Deripaska. Not once in the acres of coverage did you mention that George Osborne, who also accepted my hospitality, found the opportunity of meeting with Mr Deripaska so good that he invited the Conservatives’ fundraiser Andrew Feldman, who was staying nearby, to accompany him on to Mr Deripaska’s boat to solicit a donation. Since Mr Deripaska is not a British citizen, it was suggested by Mr Feldman, in a subsequent conversation at which Mr Deripaska was not present, that the donation was “channelled” through one of Mr Deripaska’s British companies. Mr Deripaska declined to make any donation. I mention this because it turns out that your obsession with Mr Mandelson is trivial in light of Mr Osborne’s actions. I also think it ill behoves all political parties to try and make capital at the expense of another in such circumstances. Perhaps in future it would be better if all involved accepted the age-old adage that private parties are just that. Further to the article I posted a link to above,here is the article from the sunday times that is referred to In the snotty letter from Nat R'child..
Seperating the he said she said I guess the press will not be allowed to ask the $64,000 question why were these people there and why was Mandy staying there ? Something going on here for Nat to go public for such a small fry we will not know what is going on. They are all bIldereberg chums and Nat was in the same club as Osborne. Mandy to ursurp Brown ? The real test for a politician is would you let them babysit your children? Ho ho ho! A Bullingdon Club fallout after Osbourne's 'moment of honesty' makes international news. Nat. Rothschild, son of Britain's Jacob Rothschild who lives in the Vale of Pewsey near Avebury, swoops into the fray. He can't bear to see Mandelson, his protégé spawn, exposed as an Aluminium tariff 'fixer' for his Oligarch mate Oleg Deripaska by Osbourne. The attack on Osbourne is a non-story since Osbourne may have been offered a donation but turned it down, an incredible 'storm in a teacup'. Between the lines of this story is the fact that when a Rothschild says jump, the British media, particularly the BBC, says 'How high?'. Tebbit jumping in with his idiotic quote bout dogs and fleas also indicates he's a Rothschild pawn. The real story is the entrapment strategies of the Rothschilds, sordid use of super-rich Russian Oligarchs, their absolute anonymity, and what happens when you break the Rothschilds' 'Chatham House rules'. It is a tale of political intrigue, mutual accusations and an awful lot of cash. The British media has been sent into a frenzy over the links between two of the country’s leading politicians and Russia’s richest man. 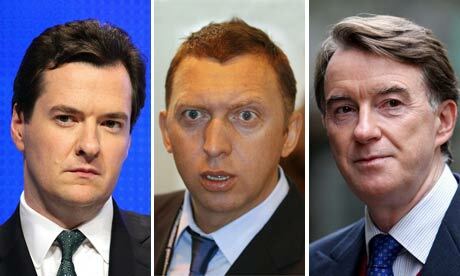 A TYCOON who clashed with Lord Mandelson's billionaire friend Oleg Deripaska has sought sanctuary in Britain. The Standard reveals that the Home Office, advised by the security services, decided that businessman Mikhail Gutseriev would be at risk if he was made to return home to Russia. The Rev Ian Paisley refused to speak to Mandy because he "was a sodomite "
Posted: Fri Oct 24, 2008 7:28 pm Post subject: Mandelson, Osborne, and ... McCain? Lord Mandelson's contacts with the Russian tycoon at the heart of the Corfu yacht row date back earlier than previously acknowledged, reports say. The Guardian says he met Oleg Deripaska in 2004, shortly before he began work as EU trade commissioner. EU officials previously said the two had met socially in 2006 and 2007. Worth a whole new thread on this nest of vipers, The Bullingdon Club. Stepping on the yacht in Corfu for the now-notorious drinks party, George Osborne failed to notice the intricate bond that united his fellow holiday-makers. Rather than the eclectic group of rich at play, the Shadow Chancellor was unwittingly made privy to a closely guarded relationship between Mandelson and the Rothschild family that spanned nearly two decades. During this time, their business and personal lives had become entwined many times including, on this occasion, with their mutual friend the Russian billionaire Oleg Deripaska, and had forged a far stronger bond than Osborne could claim with his university chum and host, Nathaniel Rothschild. Mandelson was first introduced to Lord (Jacob) Rothschild over 15 years ago when he was just gaining influence as an architect of the emerging New Labour. As an important patron of the arts, Rothschild already had plenty of contacts across the political parties. As well as being chairman of the National Gallery and the National Heritage Memorial Fund, Rothschild was put in charge of distributing the proceeds of the National Lottery to the heritage sector, an influential post which oversaw the distribution of £1.2 billion. At the time, Rothchild’s only son Nat, was struggling. After Eton and Oxford, where he’d been a member of the Bullingdon Club with Osborne, Nat decided to travel. He met model and socialite Annabelle Neilson on a beach in India and eloped to Las Vegas to marry. In the mid-1990s, Rothschild appeared in New York, apparently recovering from drug addition. But within a few years this had changed. Nat had not only developed his own financial career but had also struck up many contacts with the new breed of Russian oligarchs with his father. Nat also met David Slager, a financial genius, with whom he helped set up the hedge fund Atticus Capital: Nat used his charm to secure money from investors which Slager then managed. It proved a winning formula, catapulting Atticus into one of the most powerful funds in the world and Nat into new riches. Throughout this time a firm bond was formed between Nat and Mandelson, to whom had been introduced by Lady Rothschild in the early 1990s. The politician, the arts patron and hedge fund manager have remained firm friend for years, united by ambition, a gift for networking and a passion for rich and famous people. It was into this circle that Osborne was invited in Corfu in the summer – and to which his mind turned back when seeking political gain weeks later. Mandelson’s triumphant return to the Government as Business Secretary grated with Osborne who was under attack for his low-profile during the financial crisis: tipping off a newspaper about Mandelson’s friendship with Deripaska seemed the perfect way to steal his thunder. The ferocity with which Nat came out with a counter-attack on Osborne shocked his former Oxford friend as much as it baffled everyone else. Speculation raged that Nat’s finances were under pressure. With the Russian stock market collapse, some of the oligarchs whom Nat advised were struggling financially while Atticus was also performing badly. Rumours had been swirling in the markets that the fund, which is down 45% this year, was close to collapse because Nat’s Russian contacts were brutally withdrawing their money. But Atticus has said that it does not rely on Russian investors and is not threatened by redemptions but rather has distanced itself from its co-chairman. Earlier this month, Mandelson’s spokesman said Deripaska had met Mandelson in 2006 and 2007, well after these decisions. But yesterday Mr Mandelson said he had in fact met him before. Now there is speculation among Mandelson’s opponents that the aluminium tariffs is a smoke screen hiding other bigger controversies. Chief of these is a complex court case over the disputed sale of Russia’s second biggest insurance firm, Ingosstrakh. Mandelson’s office became involved via MEPs who were supporting EU shareholders who blamed Deripaska when the value of their stake in Ingosstrakh was reduced. Mandelson’s spokesperson has strongly denied anything irregular in the case but it remains the case that the Tories were about to put down Parliamentary questions on the matter when Osborne’s involvement in the Corfu drama broke. With his third political life under threat almost as soon as it had begun, insiders say Mandelson turned to Nat, the man responsible for Osborne’s presence in Corfu in the first place. The world is a business. Anything else is for the naive. DUBLIN (Reuters) - Irish authorities have seized what they believe is cocaine with a street value of about 500 million euros (413 million pounds) on a yacht off the southwest coast of Ireland, the army and police said on Thursday. Irish navy and police, with British and international assistance, found the suspect packages on a 60-foot yacht, Ireland's Defence Forces said. "Three males between the ages of 44 and 52 are currently in Garda (police) custody," it said in a statement. The drug haul appeared to exceed last year's record 440 million euro seizure in County Cork, public broadcaster RTE said. Every now and then a story breaks in the mainstream media that gives us a glimpse of what really lies under the stone and beyond public sight. Such are the revelations in the last week about British politicians from both the main parties meeting with Russia's richest man on his yacht moored at the Greek island of Corfu. The two politicians involved may be British, but not the theme. In every country, not least the United States, there are people just like these meeting with people just like this to discuss matters of 'mutual interest' while the public are excluded. After all, who are we to these guys? We are just there to fund their lavish lifestyles and accept their manipulations of our lives without question. Invariably, when some political scandal breaks in the UK the name Peter Mandelson is not far from centre stage and often he's the star of the show. This guy, a Rothschild front-man, is someone everyone needs to know about, not just the British. The word 'sleaze' is defined as 'informal behaviour in public life considered immoral, dishonest, or disreputable'. The term 'slither' is described as 'to glide or slide like a reptile'. Put the two together and, hey presto, it's Peter Mandelson. Peter Mandelson, Mr. Slither and Sleaze, or 'Mandy' as the media often refer to him, has what they say in polite company a 'chequered history'. I would say that he's a man you would not trust to tell you the time in a roomful of clocks. He's a sort of British Karl Rove, the Svengali behind most of the Bush years in the United States. Mandelson is the man whose manipulations brought Tony Blair to power for ten years in 1997 and together they advanced the Rothschild-Illuminati agenda, in league with the Bush cabal, to install a centralised global dictatorship. Mandelson was not always officially with Blair during this period because our Mandy has this fetish for very rich people, a condition that continues to this day, as we shall see, and they have got him into considerable trouble. But officially, and unofficially, this is the guy who 'made' Tony Blair more than anyone else. Peter Benjamin Mandelson, now Lord Mandelson, is the son of the advertising manager at the Jewish Chronicle. After the obligatory education at Oxford University, the Illuminati's premier centre for targeting and indoctrinating the next generation of 'leaders', he became involved in politics, both with the Labour Party and the Young Communist League. He became a Labour Party Member of Parliament in 1992, worked to install Tony Blair as leader over his rival Gordon Brown, and then ran the General Election campaign in 1997 that put Blair into Downing Street. Together they transformed the Labour Party, which was created in 1900 to represent the interests of the poor and exploited masses. Instead, they made it a mirror of its supposed 'opposition' Conservative Party, the traditional representatives of the rich and privileged. They even changed the name to 'New Labour'. Mandelson is an extremely slimy operator who stabs his targets in both the back and the front just to be sure. He was really the first man to be given the title of 'spin doctor' in Britain and he's also been appropriately dubbed by the media, 'the Prince of Darkness'. But he does have that unfortunate fetish I mentioned and it keeps catching up with him. His first enforced resignation from the Blair government came in 1998 when it was revealed that he had bought a house in Notting Hill, London, with an interest-free loan of £373,000 from a millionaire Labour MP called Geoffrey Robinson. The problem was that Mandelson was Secretary of State for Trade and Industry, the very department that was investigating the business affairs of Geoffrey Robinson. Oops, bye, bye Mandy. Ten months later Blair brought his mentor back into government as Secretary of State for Northern Ireland after a vicious campaign to undermine his predecessor, Mo Mowlam. But he only lasted two years before he had to resign again. This time he was exposed for seeking to intervene in an application for British citizenship by Srichand Hinduja, an Indian businessman who was, with his brother, under investigation by the Indian government over a corruption scandal. British government ministers are strictly forbidden to support a citizenship case in this way and once again it was bye, bye, Mandy, as he left the scene, as always, claiming innocence. So what do you do with someone who has had to twice resign from government over alleged corruption or inappropriate behaviour? Well, of course, you give him a massive salary, plus enormous expenses, to work for the European Union. Blair-the-puppet did the necessary to make it happen. The EU and Mandelson were made for each other and it's no surprise that he has spent his political career pressing the case for more centralisation of power for the bureaucrats in Brussels. 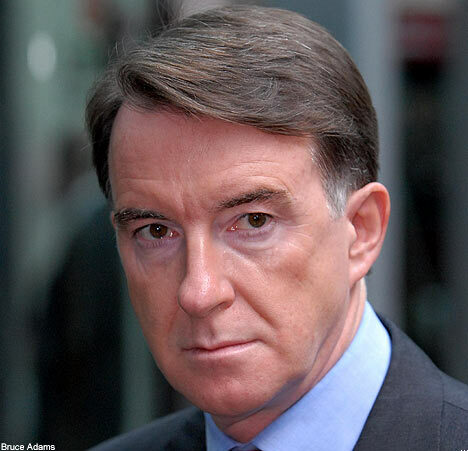 Newspaper reports claimed that Mandelson requested an £80,000 Maserati for his official car. This was so outrageous that even the grotesquely extravagant EU bureaucrats would not have it. Mandelson became EU Trade Commissioner in 2004, an extremely powerful job with enormous potential for corruption if you have such tendencies. Just months later, in April 2005, the London Times exposed Mandelson for spending time on the yacht of Microsoft co-founder, Paul Allen - just when Microsoft was the target of a major EU trade investigation. All of which brings us to another yacht and the story that has been blazed across the British media in the last ten days or so. In August this year, while still European Union Trade Commissioner, Mandelson was the guest on the yacht of Oleg Deripaska, Russia's richest man, and known as the 'king of aluminium'. The meeting was apparently connected to a party hosted by Rothschild family, with whom Mandelson is extremely close. Deripaska had his visa to the United States revoked last year and a court case in America has linked him to organised crime, though he denies the connection. 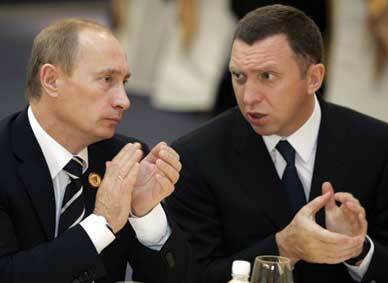 Russia's Vladimir Putin with Oleg Deripaska. All this is highly significant because Deripaska's companies massively benefited, by up to £50 million a year, from the decision by Mandelson and his EU trade department to lower tariffs on aluminium. Mandelson has refused to detail his other private meetings with Deripaska or even to say if they discussed aluminium. Oh, I think there's a fair chance, you know. According to the London Sunday Times, Mandelson's Corfu holiday happened during a new investigation into aluminium foil tariffs that could have adversely affected one of Deripaska's companies. By the time this story broke, Mandelson had left the EU to return early last month to the British government, now under Prime Minister Gordon Brown. He was named Business Secretary at the height of the panic over the banking crisis and, as ever with Mandelson, he immediately promoted the Illuminati 'solution' of a new global financial structure. Mandelson and Brown: Different Prime Minister, same puppeteer. Brown can't stand Mandelson, and the feeling is mutual, but he needs his manipulation skills and his close contacts with people like the Rothschilds to give him any chance of winning the next General Election. As soon as Mandelson returned, Brown's public image began to improve after a disastrous year and he was promoted as a hero for his bailout with taxpayers' money of British banks. Given that Britain is now paying the price for ten years of Brown's tenure under Blair at the Treasury Department, this is like someone smacking a guy about the head with a baseball bat and then being dubbed a hero for driving him to hospital. But Mandelson has 'contacts'. So that's just some background to Peter Mandelson and his meeting with Deripaska on his yacht in Corfu. But there is another aspect to this. Also there was Mandelson's political 'opponent', George Osborne, the financial spokesman, or 'Shadow Chancellor', for the Conservative Party. Like Mandelson, he is an attendee of the Illuminati Bilderberg Group. So here we have the Labour Party and EU representative, Peter Mandelson, and the Conservative Party's Treasury spokesman and possible next Chancellor of the Exchequer, George Osborne, both meeting together secretly with Russia's richest oligarch. Mandelson was EU trade minister, the head of a department that made decisions to benefit Deripaska, and it now turns out that Osborne tried to tap the Russian for a large donation to the Conservative Party when it is illegal for political parties to accept foreign money. Two pigs, same trough. This is the real nature of global politics in the one-party state behind the smokescreen of 'democracy'. This is but a snapshot on one day of what is the norm throughout the world where the rich and their political associates run the show for themselves. George Osborne has been pilloried in the media for seeking the donation, but the story would never have been uncovered had he not made the most cardinal of errors by breaking the most important code in the rulebook of the Elite - the code of silence. Osborne leaked a conversation he had with Mandelson in a Greek Taverna around the time they both boarded Deripaska's yacht. 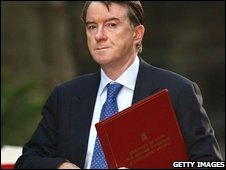 The media reported that Mandelson had 'dripped pure poison' about Prime Minister Gordon Brown during the chat with Osborne. In leaking this information, Osborne broke the code of what these deeply corrupt people call 'honour' and so he had to be punished. Enter the Honourable [No, really] Nathaniel Philip Victor James Rothschild. 'Nat' Rothschild is an extremely wealthy financier and the only son of Jacob Rothschild, the 4th Baron Rothschild. These people love their ludicrous titles. Nat Rothschild is a very old friend of George Osborne, going back to their time together at the elite preparatory school for under 13s in London called Colet Court with its Knights of Malta logo. Osborne and Rothschild also attended Oxford University together, but 'friend' or not, you can't break the code that binds the network together and ensures its secrecy. After Osborne's private conversation with Mandelson had been leaked and subsequently Mandelson's attendance on the Deripaska yacht was revealed by the London Sunday Times, Rothschild wrote to its sister paper, the Times, to drop Osborne right in it. 'I mention this because it turns out that your obsession with Mr Mandelson is trivial in light of Mr Osborne's actions. I also think it ill behoves all political parties to try and make capital at the expense of another in such circumstances. Mandelson is a major Rothschild front-man, far more important to them than Osborne, and all that 'age-old adage' stuff is a warning about what happens when you break the code. From an early age, the offspring of the elite families are taught the facts of life. They are above the rest of the people, born to rule and must always look after their own. Most importantly, they must respect secrecy and confidentially to ensure that their network is a water-tight unit. One example of this system of early 'bonding' has been highlighted as an offshoot of the Mandelson-Osborne-Rothschild story. It is called the Bullingdon Dining Club. Well, 'dining club' is the official title, but it's really a club for the richest and most privileged Oxford students to get paraletically drunk and smash up restaurants. Then they go off to run the country. Last December, all 17 members were arrested for wrecking the cellar of a 15th century pub with 17 bottles of wine smashed into the walls after their 'dinner' became a scene from a Wild West saloon. Four members, including the ringleader, Princess Diana's nephew, Alexander Fellowes, were jailed for the night. On another occasion 550 windows at the college of Christ Church in Oxford were smashed in one evening by Bullingdon members. 'I like the sound of breaking glass' is apparently one of the society's mottos. These are the same people who then move on into politics and condemn 'drunken violence' and vandalism. Two such hypocrites are David Cameron, now leader of the Conservative Party, and boss, at least in theory, to George Osborne; and Boris Johnson, the current Conservative Mayor of London. Both were Bullingdon members at the same time. David Cameron, who sells himself today as a 'man of the people' as he seeks to be Prime Minister, is number two in this picture; and the buffoon-like Boris Johnson is number eight. Here they are today. The arrogant, over-privileged, drunken yobs of the Bullingdon Club are now condemning as politicians the drunken violence among the general public. They should know. What we have seen in Britain in the last few days is a glimpse of how the 'club', so brilliantly described by comedian George Carlin in the clip below, operates throughout the world. The children of the elite families are brought up specifically to maintain the control of the bloodline and money oligarchy in the next generation and they are bonded together in exclusive clubs and societies to form relationships that last their whole lives. Crucially, they are warned to honour the code of silence and secrecy, a fact that George Osborne forgot to his cost and will not do again. They then go on to be politicians, bankers, business people, media owners and military leaders etc., who are bonded together by shared 'values', outlooks and goals. They may be in apparently 'opposing' political parties, banks, corporations and so on, but they are answerable to same codes of 'honour' and 'duty' to each other and their privileged 'class'. Behind the scenes they conspire together, and do deals and favours together, while telling the people they are governed by a 'free' democracy based on equality of opportunity and the same rules for all. It's a joke and it always will be while we continue to stand for it. I suppose it all depends on how you define “people”. The city [Tbilisi] has the trappings of a vibrant western economy. Billboards advertised designer products. The one-time Marxism-Leninism Institute is now a five-star hotel. Russia’s elite value their ties to Europe - their shopping and their luxury weekends. We should look at the visa regime for Russian citizens. Russian armies can’t march into other countries while Russian shoppers carry on marching into Selfridges. Lord Mandelson is desperately trying to crank up pressure on left-wing Labour MPs to support his plans for the part-privatisation of Royal Mail. His latest weapon is a leaked letter from the chairman of the trustees of Royal Mail's pension fund, briefed out by officials at the Business department last night. In the letter to Lord Mandelson, the chairman Jane Newall warns of "devastating consequences" if the Government does not take on responsibility for the fund. (The Goverment taking on direct responsibility for the £7billion deficit is part of the deal to sell a minority stake in Royal Mail to a foreign competitor like TNT) . Yet experts are questioning why Miss Newall has agreed to write a such a nakedly political letter now. It could have been written at any point in the past few years. The timing, ahead of the publication of the part-privatisation plans on Thursday, cannot be accidental. ..........Throughout this time a firm bond was formed between Nat and Mandelson, to whom had been introduced by Lady Rothschild in the early 1990s. British Business Secretary Peter Mandelson urged British firms on Monday to invest in Iraq, saying a spate of bombings in the Iraqi capital that killed 34 people did not belie the country's recent security gains. Accompanying what he said was the first group of British businessmen to visit Iraq in 20 years, the minister said Iraq had laid out a large welcome mat on its doorstep. "This delegation marks the fact that Iraq has turned from a place of conflict to a land of opportunity," Mandelson said after meeting Prime Minister Nuri al-Maliki and other officials. 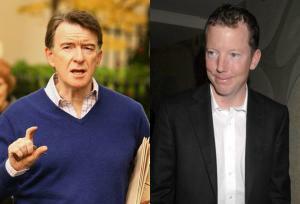 Posted: Sun Jun 07, 2009 1:52 am Post subject: Re: Mandelson, Osborne, and ... McCain? Prime Minister’s personal handling of the business conflict in the town of Pikalevo has set a precedent in the public dressing-down of the country’s top businessmen for neglecting their social responsibility. Interestingly, one of the people receiving the dressing-down was one of Russia’s most famous businessmen, Oleg Deripaska, who used to be the richest man in the country until the global financial crisis left him heavily in debt. The high-point of the show was Putin virtually arm-twisting him into signing a contract, which was needed for the troubled factory to start working again. During the meeting, chaired by Putin, Deripaska was obviously unnerved, with cameras catching his every move and facial expression. Never before has a person of his caliber been publicly humiliated this way in modern Russia. The experts are now confused over what this may mean. Was it the government’s signal to big business that they are not allowed to put their economic interests before social considerations? Will workers of the many troubled companies throughout Russia now be encouraged to take to the streets, expecting Putin to personally micromanage every labor conflict in the country? The situation resembles that of Dmitry Medvedev’s personal blog, which people now use, with a moderate degree of success, to report on injustices and the faults of local authorities. Vladimir Putin is well known for his heavy temper and the ability to lash out with his angry words. However, previously his involvement in conflicts between business-owners hasn’t become public news, with all the hard talking done behind closed doors. I must admit this puzzles me as I had Putin down as a fake patriot secretly in tow with the Oligarchs. The ties being Freemasonry. Come to think of it Hitler is another enigma. Financed by Jews and US MIC. Without him there would be no Israel. Then you have to think about Jewish-controlled USA turning away shiploads of Jews around time of WW2. Obviously the crime of 'Holocaust Denial' has been created for a reason. They are in the same extended family. Look at the body language. Absolutely true. They are God, and we are cattle. Silly pointless let your hair down stuff - except that excesses may be recorded for future leverage, and a psychological 'bonding' process is furthered. The club gets more tight knit. But the Bullingdon is not top-tier control. Top Tier who knows but Rothschild, Rockefeller, Kissinger, Soros - that is the strata to start from. Even Mandy is at least one rung lower I suspect. About the same level as Stalin, Lenin, Hitler. To get higher than Rothschild etc I suspect you are getting into the occult. Isn't that the entire point? 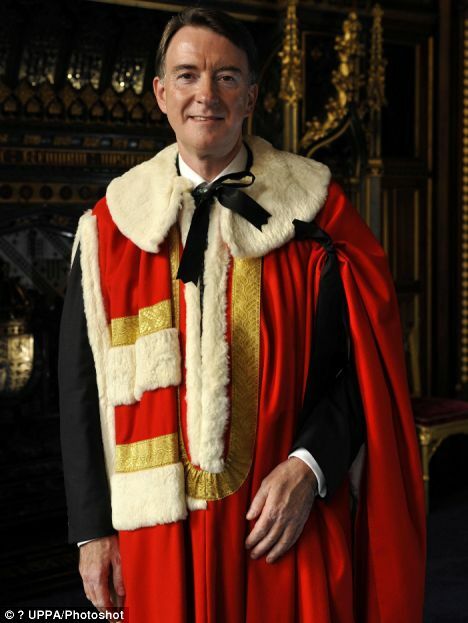 This unelected lord of darkness is running the show on Monday.